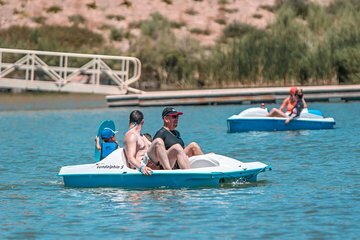 Beat the heat in sunny Las Vegas, and spend 2 hours relaxing on the waters of Lake Las Vegas. Because pedal boats are easy to use, you can cruise along the waters yourself or bring up to 3 friends or family members with you. Get some exercise and enjoy the outdoors in between playing the slots and seeing the shows of Las Vegas. 2 hour on a pedal boat for 2 adults and 2 small children under 50lb.